Sugar Cubed made the cake for our recent Mount Hood Skibowl wedding- a two-tier nearly naked red velvet beauty!! It tasted as good as it looked! Definitely recommend! Honestly cannot say enough great things about this place! We already had a cupcake order through them for our big day, while our cake was being made by someone else. However the previous cake baker backed out last minute, and Sugar Cubed was able to accommodate us by making us a simple (yet beautiful!) cake for the big day! And bonus-- they were so nice about the issue and made it seem super easy to get everything ready to go! Thank you guys! This place is the BEST! My husband and I were immediately wowed by Kayla and her love of all things cake! We immediately cancelled our other tastings and booked her for our wedding. The cake was simply amazing. We had a three tier, three different flavor cake and each flavor was fantastic. She puts her own spin on things such as a ruby red velvet with a raspberry compote - amazing! If you're looking for a bakery for your wedding or really any other event...this is the place to go! She has built this business up with her bare hands and her love for it is evident in every bite. Beautiful and delicious cake! Everyone raved about how good our cake was, thank you Sugar Cubed Cake Creations! I will not hesitate to recommend you to friends and family. Words cannot even described my cake and cupcakes. I went in and met with Kayla once and showed her what I wanted. The day of the wedding it shows up and is absolutely stunning and so well done. If there was a place to add a picture I would. Kayla was honest, professional, and I would highly highly recommend her and Sugar Cubed again. Thanks for making my day special. Kayla was great to work with, very responsive. The cake was beautiful and most of all it tasted great! Can't wait until our next special occasion so we can treat ourselves again! Kayla was so great to work with. Very professional, and responsive to all of my questions. 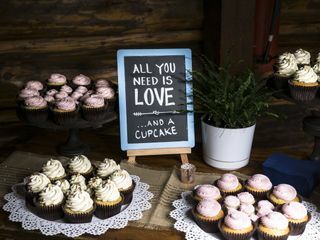 She came and set up the cupcakes and cake at my reception venue, and did a great job with all the props I had set aside for her to use. Her cupcakes were so delicious. I still have wedding guests reach out to me asking where I got them. I would highly recommend Sugar Cubed Creations for any sort of event. THIS WAS THE BEST CAKE EVER!!! I had a really unusual request (a cake that looked like a Scotch tape dispenser as a surprise cake for my spouse) and Kayla made that idea an incredibly fun and delicious reality! The cake disappeared as soon as we cut into it because it was so good and looked so great! I would highly recommend working with Kayla at Sugar Cubed Creations and I will definitely be ordering a cake from there again! We received endless complements to the chef. Everyone loved trying the different flavors of cupcakes, all which got rave reviews! Her carrot cake, to die for! Beautiful cake that is delicious !!!! Best tasting and looking cake we can find and the hubby and I are a little bit of cake snobs, Kayla is professional and easy to work with. Entire transaction was almost too easy !! Absolutely the best tasting cake our guests ever had. I feel the same. Overall it was perfect! Our wedding cake and cupcakes from Sugar Cubed were amazing! Kayla was wonderful to work with and very professional. The cake was delicious and moist, and all of our guests raved about the quality. 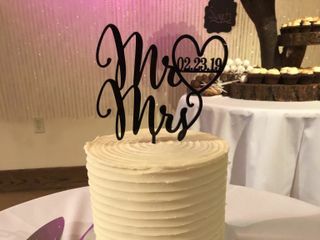 We were able to serve a variety of delicious flavor combinations and even accommodate our gluten free guests--they remarked that her gluten free cake was the best they had ever tasted! The presentation was perfect as well. 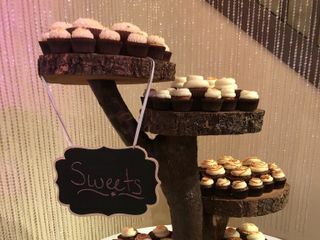 We were thrilled with our wedding desserts and would highly recommend Kayla and Sugar Cubed to anyone! Sugar cubed is the best! I sent images of personal things that my future wife enjoyed as part of the theme for the party and asked for Kayla to recreate them into cupcakes. She totally blew me away and the people who went to the shower. She created fondant replica of our dogs. It wasn't until after the wedding that it was tossed out it was too cute to get rid of!! I would recommend Sugar Cubed to everyone I know! We discussed a cake design with Kayla via email. We gave her freedom to create a cake that included our wishes and a little of her personal design touch. We had no idea it would looks as fantastic as it did that day. It made my wife so happy to see the cake she wanted come to life. A happy wife is what it's all about on your wedding day!!! Sugar Cubed is the best!! I hired sugar cubed bakery for my wedding cake and was very satisfied with with the service, cost, taste and it was beautiful! I would definitely recommend them! We hired Kayla to create our wedding cake and have no regrets! I gave her very little direction and she created a beautiful cake that fit right in with our vintage wedding theme and more than exceeded our expectations. The cake was absolutely delicious and the compliments were endless. She has so many flavors and pairings to choose from that it was hard to pick just three combinations. I cannot wait to break into the top tier we have saved for our first anniversary. Kayla at Sugar Cubed was absolutely amazing to work with! We had her create the cake for our wedding and it was absolutely gorgeous! My wife and I wanted to have an absolutely gorgeous wedding but we also were working on budget and Kayla provided information to help us keep the costs down while still having a beautiful and delicious cake. Kayla built a three tiered wedding cake and decked it out with pearls and flowers. 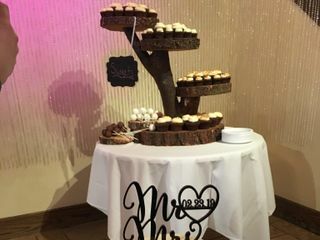 She kept our costs down by making the first two layers of the cake faux and providing cupcakes of all different sizes for our guests which matched the cake. We had a lot of compliments from guests and the cake was a huge hit. Kayla is extremely talented! Kayla was very highly recommended by my sister-in-law Liz, I know when she reccommends me to someone, I value her opinion! I was so grateful that Kayla was available to make my wedding cake! She did a phenomenal job on my cake! I gave her a challenge with my idea of how the cake should look and she was so excited and took it on! The cake was just so romantic and beautiful, and tasted so yummy! The cake was so moist and flavorful, we couldn't stop eating it! Kayla is very professional and she is very easy to communicate with! She was puncutal on the day of the wedding, and got straight to work! She displayed the cake perfectly and added a gorgeous arrangement of flowers to give it that extra little touch of elegance and romance! Sugar Cubed Cake Creations was so professional, fairly priced, and delicious! So easy to work with and very thorough on the details to get us exactly what we wanted. Everything was on time and organized the day of the wedding. I was blown away by how beautiful it all looked. We decided on a small two tier cake and approximately one-bizillion cupcakes in different shades/colors & flavors. I would definitely recommend this vendor to a friend, I was so pleased with the interactions & the final product from this vendor. Our wedding cake was so beautiful and just what we asked for. Sugar Cubed matched our colors and vision perfectly! Thank you so much for our gorgeous wedding cake! Very delicious flavor options too! Kayla is amazing. She put my multiple ideas together and gave me the cake of my dreams. It was delicious and she even arranged by table decos for me. I will be referring everyone I know! The wedding cake was beautiful and tasted amazing! Sugar Cubed did an amazing job!! She took my colors and developed a style of her own that was simply beautiful! She made our wedding that much more special with her wonderful design and amazing tastes. 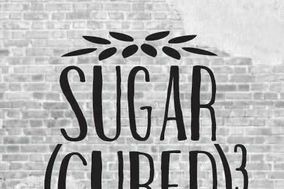 I would recommend Sugar Cubed to all my friends in the OR/WA area. Thank you THANK YOU! !